CBD is blowing up, and quickly. Last year it seemed like a new thing for anxious dogs and now it’s showing up at the top of coffee bar menus and 2019 trend lists. Here’s what you should know and what happened when I tried it. In short, CBD is the chemical in weed that doesn’t get you high and has some health benefits. Technically, CBD stands for cannabidiol and it’s a compound found in cannabis plants such as hemp and marijuana. There are many compounds in hemp and marijuana but CBD and THC (delta-9-tetrahydrocannabinol) are the most prevalent and the most interesting. CBD — cannot get a person high and is not mind-altering. Hemp has high levels of it, and is not a controlled substance. THC — gets a person high by altering cognition and sensory perception. Marijuana has high levels of it, and is classified as a controlled substance. For decades, scientists thought CBD was biologically inactive in humans but recent research has shown that it may it actually have some major health benefits. CBD is exciting because of its potential therapeutic effects on anxiety, inflammation, pain and insomnia, which the majority of humans experience at some point. Animal studies have found that CBD applied to the skin can reduce pain and inflammation due to arthritis, and that it has the ability to inhibit chronic pain from inflammation and neuropathy. In humans, studies have shown that it may help a person fall asleep and stay asleep. There are also trials investigating CBD’s effectiveness in treating PTSD as well as alcohol and opioid addictions. The strongest evidence and most powerful use for CBD is its ability to treat severe epilepsy and seizures, especially in children with rare seizure disorders that don’t respond to any other medicines. Since CBD is not a psychoactive drug, it is safe for children, pets, and anyone looking for a natural way to help manage anxiety, pain and insomnia. SO EVERYONE’S COOL WITH IT? A new Farm Bill provision was signed in December declaring that hemp is no longer a controlled substance. This means that hemp products can be sold across the country without any interference by the DEA. The FDA approved the first ever cannabis-derived medicine, and it’s a CBD-based drug for children with seizure disorders. However, the FDA abides by a clause that says if something was used in clinical trials first, then the pharmaceutical industry gets a monopoly on it and it is unlawful to market it in dietary supplements or food. Bottom line, it’s not a drug and it’s legal to sell …. but it’s being used in a medicine so it’s not legal to sell as a supplement or a food. A little confusing. But if Wegmans is cool with it, then I am too. SAY I WANTED TO TRY IT … HOW WOULD I? CBD is unquestionably safe and potentially therapeutic, which describes a lot of natural plant compounds we use. It’s like using ashwaganda or lemon balm, except potentially more effective. 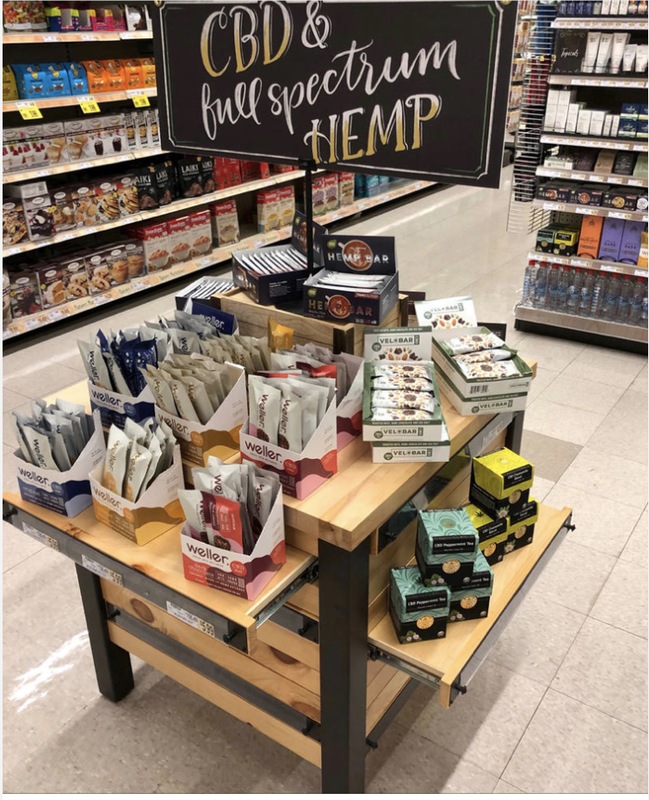 CBD can be taken straight or infused into just about anything, and we’re going to see more and more industry categories embracing CBD with creative new products. The bioavailability of CBD (how fast and how much gets absorbed) depends on how you take it. Vaping — absorbed quickly and effectively, but the vape life is not for everyone. Sublingual — holding a few drops of a tincture under your tongue lets it absorb into your capillaries, its fast and relatively effective compared to vaping. Ingestion — the most popular (capsules or infused food and drink) but it must pass through the digestive tract so absorption is low and slow. Creams and lotions — very low absorption. Injection and suppositories — very quickly and highly absorbed, but please don’t. As “research” for this article, I tried some CBD. I’ve never smoked or eaten anything with cannabis so to my knowledge this is the first time CBD has entered my body. I swallowed the full dose ( 1 ml ) of Charlotte’s Web Extra Strength oil. I took it on a Sunday to see if it would ward off the Sunday scaries. And honestly, I didn’t feel anything. I still got a regular case of the scaries. However, I did have a headache that went away after taking it. I don’t know if it was the CBD helping or the headache was going away on it’s own, but that was intriguing. I’m not discouraged from trying it again. Because it’s not yet regulated, who knows how much CBD was actually in the oil that I ingested. Maybe what I had eaten that morning interfered with the absorption. I would like to try it again but perhaps a different brand, strength, or method. The research on dosage is limited, so we don’t really know what an effective dose is. Since CBD is sold as a supplement rather than a medicine, the products are not regulated. Just like with other supplements, you may not be getting exactly what it says on the label. Also, don’t believe false marketing claims. CBD can interact with some medications, so always check with your doctor first.